Self-help authors offer an endless supply of books aimed at making you, the reader, a happier and more well-rounded individual. If you’ve bought these books and they’ve fulfilled all they promised, we’re sorry because people tend to be suspicious of happy people. They think they’re up to something. Bailed-out bankers tend to be happy. 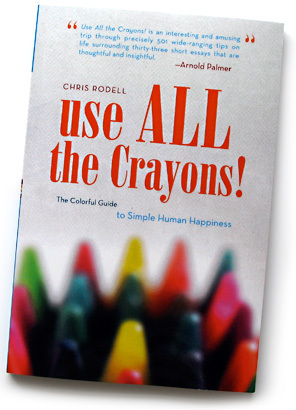 This book doesn’t promise to make you happy, but it’ll make you more fun and more interesting—more colorful. A healthy and aware happiness is bound to ensue. Happy people, you see, aren’t necessarily colorful, but colorful people are universally happy. People resent happy people. They invite colorful people to all the coolest parties. I’ve never had a lot of money. In fact, for many, many years, my idea of a splurge has been to order a pizza with pepperoni and sausage. But since kindergarten, I’ve never lacked for friends, laughs, or love. I’m no smarter than most, less ambitious than all but a handful, and I’m freighted with a God-given laziness that has stifled any natural abilities others would have successfully exploited to their prosperous advantage. About four years ago, just as America began hitting a historic rough patch, it began to dawn on me that things weren’t working out so well for me either. I was constantly broke. Anticipated breakthroughs never materialized. I’d once been considered a promising young writer. With my forty-fifth birthday behind me, I was no longer young, and any promise seemed to have vanished. That was all a bit surprising to an optimist like me. But what was even more surprising was how pleased I was with my joyful little life. I was happy. I had a lovely wife and two beautiful daughters. We had a host of dedicated friends and seemed to attract squads of lively new ones with carefree frequency. Each day was filled with laughter and fun. As a freelance writer, I’d awoken unemployed for the past twenty years with a natural obligation to find something fun or lucrative to do. I was paid meager sums to write scattered features and occasional essays for magazines like Esquire, Sports Illustrated, Men’s Health, Golf, and other top magazines. It sounds prestigious, but the reality is I haven’t earned more than $21,700 during the last four years—and just a bit more than half that in the lampblack days of 2009. With professional prospects dim, I turned to blogging, the last refuge of the underemployed writer who still believes he has something to say. I called my blog www.EightDaysToAmish.com, a grim nod to the fact that I always seemed like I was a little over a week away from having to do things like churn my own butter and try raising two sassy daughters without things like electricity or gas-powered transportation. On some days I’d work. Many days I did not. Neither did my darling wife. She did part-time editing jobs and became one of those maniacal coupon clippers, the tearing din of scissors snipping paper becoming the soundtrack of our evenings. Like America, we were broke. We’d pilfered most of our savings. We cut back on insurance and health care. Every gauge we’d been conditioned to check said we should have been unhappy, distraught, angry. Yet we were not. For anyone raised to equate income with self-worth, it was a little disorienting. Money wasn’t buying our happiness. I decided to make a little list. I jotted down the things that made me laugh or feel soulful. For instance, I’d play precocious little pranks on my unsuspecting wife. She’d recruit our daughters in score-evening schemes. I daydreamed about how the world could be a better place—fax leftovers to the starving (see no. 334)!—and I wrote down what I thought. The little list began to grow. We, as a nation, remain mired in the midst of a historically difficult time. Many of us are out of work or underemployed. Yet, some of us continue to steadfastly confound the pollsters by saying we’ve never felt more optimistic about our shared futures. We believe we’ve survived the worst and our best days still lie ahead. Maybe we’re simultaneously discovering that the excesses of the past decades weren’t what mattered. It’s all the little moments of mortar between the big ones that do. Here are five hundred tips and 33 exuberant essays that will give your day a little jolt of joy. Feel free to work the suggestions into your world and add your own. Rich or poor, it’s up to each of us to color our lives as we see fit. We can sketch them out in uniformly dark colors or we can use all the crayons. I hope to see you at the party.